Each time a player performs an action that everyone needs to know about, the game server instantaneously pushes that information to the other players. In the map-based board game A Complete Tour Round the World, devised by English mapmaker Thomas Jefferys in 1770, factual geographic information was key. As players moved their tokens around the map, they were required to read aloud a description of each place on which they landed, lending the game a strong educational element. But in the more contemporary strategy-centered board game Risk, wherein players try to seize territory from one another, the game’s geographic content is quite disconnected from real-world geography and the populations that actually inhabit the six continents depicted in the game. Thinking about this encouraged Ola Ahlqvist, an associate professor in the geography department at Ohio State University (OSU), and his colleagues to see if they could develop tools that others could use to create location-based learning games that made geography—and GIS—a fundamental component for game players. And so GeoGame—a simulation framework for games of strategy based on the ArcGIS platform—came to be. With the vast collection of maps and databases available online, Ahlqvist began creating a prototype to test whether or not a game could be played in real time on an actual online map. Students involved with the project built APIs to demonstrate the concept. Ultimately, Ahlqvist received a two-year grant from the National Science Foundation to study how to implement GIS technology in the online gaming environment for educational purposes. 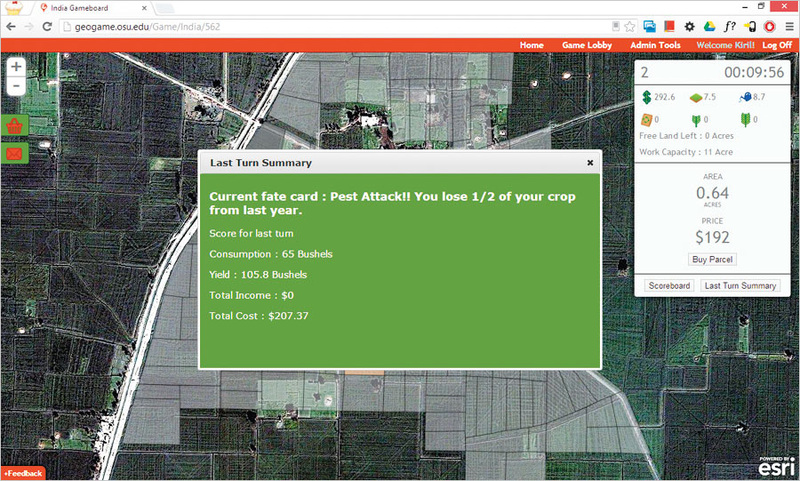 Random events like pest attacks are embedded into the simulation. The development team—which is now made up of OSU faculty members and graduate students in geography, computer science, physics, and education—constructed a web-based platform that runs a massively multiplayer online game (MMOG) on top of ArcGIS to create a learning environment that allows users to interact with real-world data and simulation models. The computing environment includes two server applications: ArcGIS Server maintains the GIS data, while the GeoGame web server handles the game transactions. But this kind of open web communication was revolutionary when Ahlqvist and his team first started developing GeoGame—before WebSockets, which makes open communication between a user’s browser and server, became an accepted standard. The developers used ASP.NET’s SignalR library to instantly communicate any changes from the server side to all the connected clients. 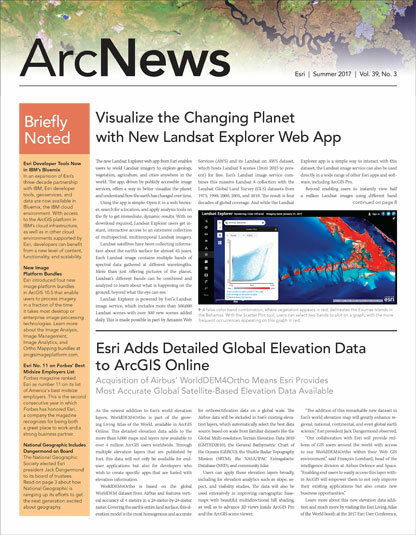 Now, the newer stream services for ArcGIS could provide similar functionality. The prototype game that Ahlqvist and his team ended up creating is called Green Revolution. 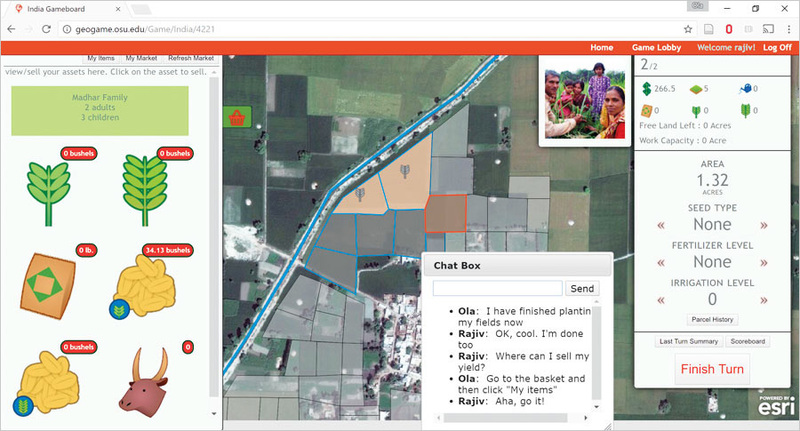 The idea for the content came from an OSU instructor teaching a world regional geography course who thought that the variables available in GIS could help her students analyze agricultural trade-offs. As the name suggests, the team based the game on the Green Revolution, an initiative from the mid-twentieth century that increased agricultural production in the developing world using techniques such as planting high-yield cereal crops, using chemical fertilizers, controlling water supplies, and practicing new cultivation methods. Since GIS is a fundamental component of the game framework, players can purchase actual parcels from a real map. This leads to some interesting cost analysis, according to Ahlqvist. The team also built social impacts into the game. For instance, players can determine the family structure. If an entire extended family lives together on a farm, there are more helping hands, but the land also has to support a large number of people. So players have to take that into consideration when making their purchases. “We can add similar processes if we wanted to calculate the market value of the harvested crops, as well as other simulation models, because they are designed in a modular way and the game employs a true GIS,” Ahlqvist explained. The development team made the GeoGame framework highly adaptable for different locations and scenarios, so different feature or geoprocessing services—such as climate, soils, water resources, demographics, weather, traffic, and social media—can be added to the game rules. “I believe that [the GeoGame framework] has great potential for analyzing interdisciplinary topics in education, research, and policy making through its use of the geospatial perspective,” concluded Ahlqvist.